Photo courtesy of Matt Berkner, Gustavus Sports Information. SAINT PETER, Minn. – The Gustavus women’s hockey team hosted Concordia on Friday night and came out with a 6-1 victory. With the win the Gusties move to 12-5-5 overall and 8-3-4 in the MIAC. After a scoreless first period that saw the Gusties outshoot the Cobbers 13-6 Concordia was able to strike first in period number two when they scored at the 7:43 mark. The Gusties were able to respond at the 11:16 when Amelia Vosen (Jr., Nowthen, Minn.) poked a pass ahead to Allie Stanger (Sr., Paynesville, Minn.) who put some handy stick work on display to notch her ninth goal of the season. 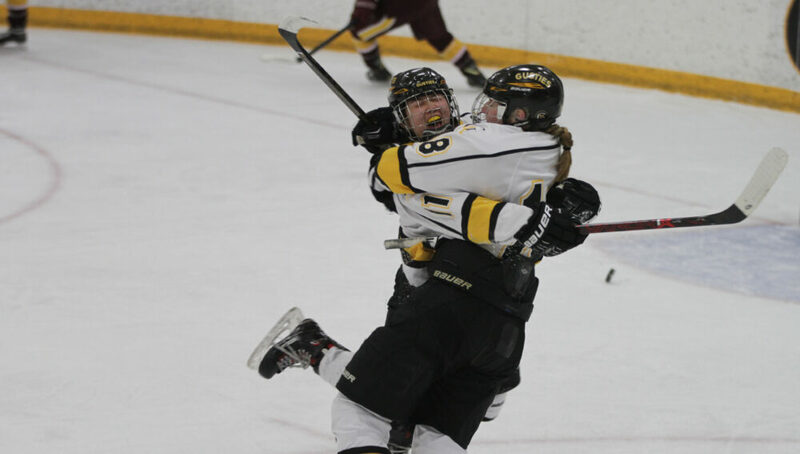 Gustavus wasn’t done there though as Vosen notched a power play goal at the 15:17 mark with assists going to Jordyn Peterson (Fy., Brookings, S.D.) and Madigan Goldsworthy (Fy., Chaska, Minn.). Less than a minute later Laine Fischer (Sr., Northfield, Minn.) got a pass from Hanna Mutschelknaus (Brandon, S.D.) and found the bottom right corner of the net for the third Gustavus goal of the period. The third period was much of the same for the Black and Gold as Stanger got the scoring started with an unassisted breakaway goal just 51 seconds in. At the 12:33 mark Stephanie Anderson (Fy., Blaine, Minn.) found the back off the net off an assist from Mutschelknaus. Gustavus got one more goal when Lilia Scheid (Fy., Stillwater, Minn.) got on the scoresheet when she scored at the 13:10 mark with assists going to Kristina Press (Fy., Cottage Grove, Minn.) and Fischer. The Gusties outshot the Cobbers 46-18 in the contest and Amanda DiNella (Sr., Oakbrook Terrace, Ill.) made 17 saves in the victory while allowing the one goal. The two teams will square off again tomorrow for a 2 p.m. contest in Saint Peter.